Been a busy year. Hope to get some more updates. 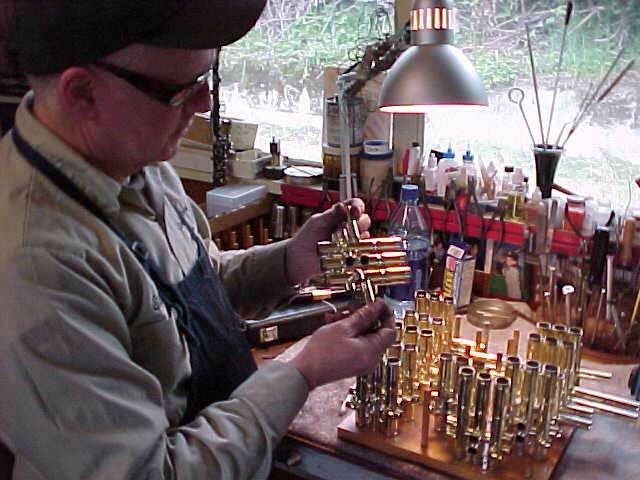 Just about finished with the Valve Repair and Rebuild Services page. Well, don't time fly. Steve and I have been buried in repair projects. I've simply not been able to tend to the website. We did have some issues with the computers but our good buddy Fritz came out and helped get the computers working properly. I will do my best to get things updated as time allows and who knows, maybe I will find the inspiration and post some new stuff in the gallery or maybe even put together another page on how we do what we do. For now, I and steve are focused on getting the repair work done and shipped. If you are really interested, look us up on Facebook. I will do my best to get more updates soon. Sorry, its still justSteve and myself, repairs come first. I have been really bad! Finally got some website updating taken care of. I have added some cool tubas and will be doing more updates soon. Sorry, its just been Steve and myself these days and the repairs come first. Well, its about time! Finally got some website updating taken care of. Its been a busy winter. Steve and I have both had some medical problems but we are getting a leg up on things and are finally getting the shop back in order. Thanks to all who have been so patient this past year. Time again for some website updating. Wow, have I fallen down on the job with this page. Lots has happened since I last posted here. Paul Avery has moved on to bigger and better things in his life and we wish him all the best of fortune. Its back to just Steve and myself. This spring Stevo will have been with the shop for nineteen years! Where did the summer go? 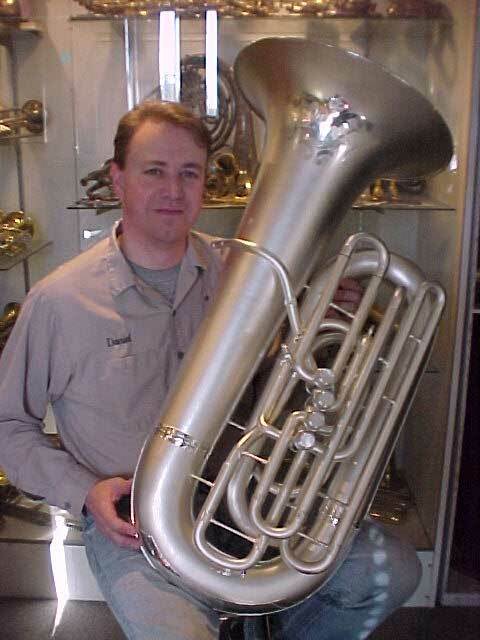 I added a bunch of trumpets to the sales pages along with a couple tubas, nice stuff. Its about time!!!! I plan to post some more trombones, an oboe and maybe a sax or two in the coming days. Hey, look me up on FaceBook. Happy Fall! I am finally recovering from my most recent heath battle (lung stuff) and am breathing better then I have in a long time. I have been hard at it completing a lot of big jobs and am really looking forward to wrapping up a lot of long overdue projects; tending to the website is one of them. I still have a good deal of work to do with updating the sales pages and will be on it soon. Thanks for the patience with my laps in maintenance. I recently started doing some video stuff, lots of fun. I have created my first new page for the website in a long time. Hope you find it of interest. Happy Spring! 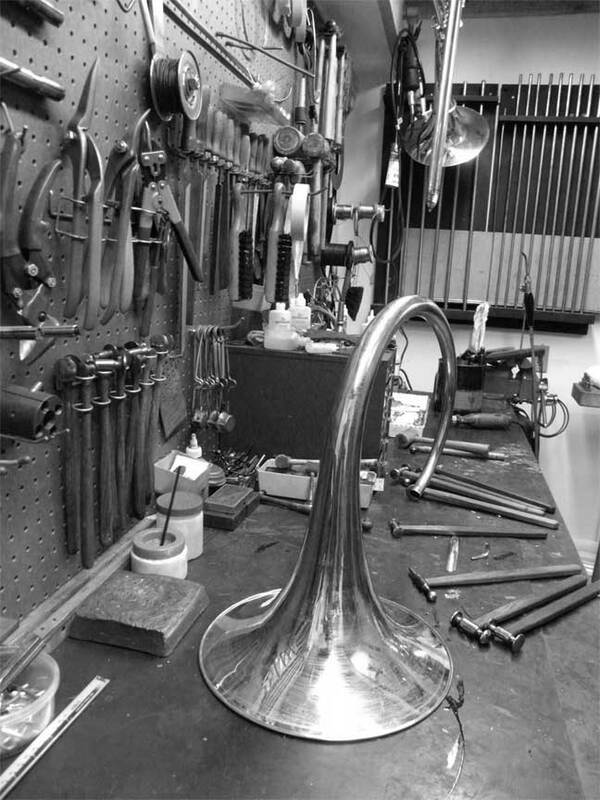 Added a few trumpets and cornets to the sales pages along with a couple tubas. 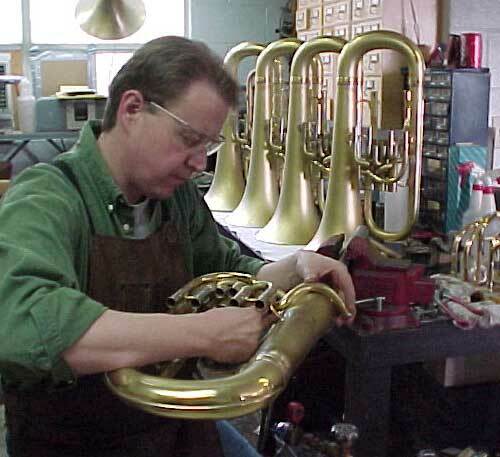 I plan to post a few double horns (Conn 8-Ds) and some trombones very soon. 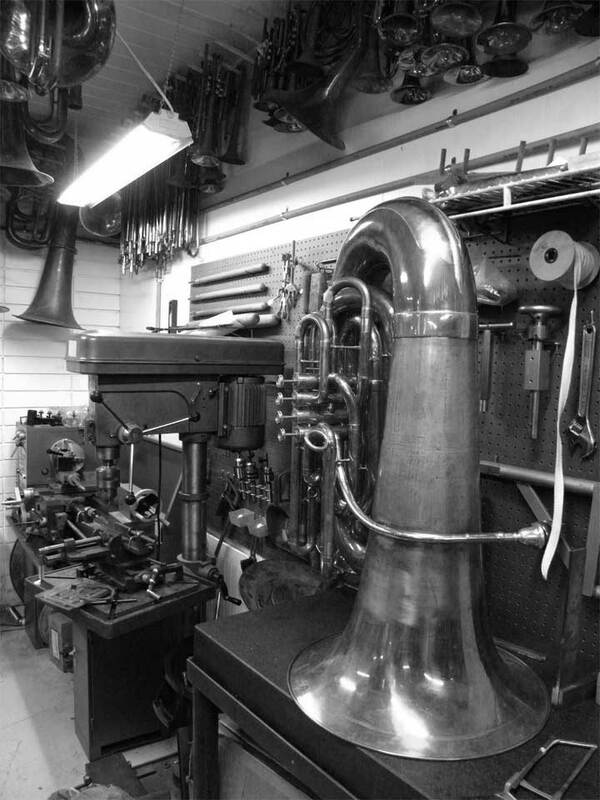 The tuba overhaul page in the gallery had a few broken links to some images (page 2), they are now corrected. I have no idea how it happened. 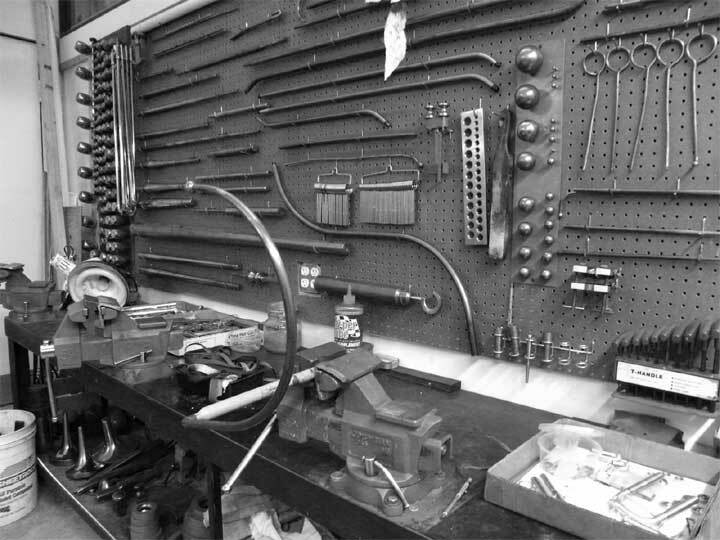 Its been a very busy winter in the shop, lots of projects nearing completion. Added a bunch more trumpets and a few cornets to the sales pages. We have had abusy fall season. We are still playing catch-up, addressing a lot of overhauls and restorations. The Pacific North West getspretty dark and damp this time of year. As you can see in the images below, the shop is reflacting the season. Images of the shop, After a very long day. Added a few trumpets to the sales pages, time to get back to work. Dan'l! added a little to the trumpet and tuba pages and plan to add more to the trombone and sax sales pages as soon as time allows. Happy Spring!! Hi All! Well it has been a busy winter for us in the shop. The move transition had to slow down and allow us time to work on horns. We will try and finish the remaining work on the shop this coming summer. We did finally get the new heating/air conditioning going just last week. December and January were pretty chilly around here with the wicked cold weather and flooding we have had in the Pacific North West. I managed to spend a little time on the web-site and added a few photo essay pages in the gallery along with some updates in the sales section. I still have more to do and will try to stay on it as best as I can. Cheers! As many who have visited the shop over the years know, we out grew the space some time ago. On July 8th Daniel Oberloh started to work building out and preparing a new somewhat larger and more comfortable space in the north end of seattle. After working non-stop, on the 28th, Steve, Paul and Dan started the relocation of the South end shops contents, it took a full week to complete the task. Since the 7th of August we have continued to work on the space installing our machinery and other equipment. With the much appreciated help of Family and Friends we hope to be settled in very soon. We will take care of web site details once the dust clears. Thanks to everyone for being so patient. 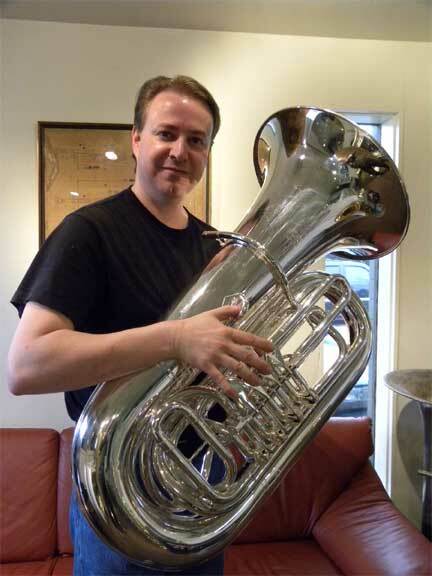 Custom 1930s BBbYork tuba reconfiguration and restoration completed by Dan this summer. Dan and Steve have a great many instruments to rebuild and/or customize between now and the fall. We will do our best to assist those with standard/ general repairs and maintenance with our typical quick turn around time. Well, we had a bit of a set back this past month. Dan is a bit gimpy. He has been having neck and back problems that have slowed him down and made working on the big horns difficult. Fear not, he is slowly recovering and with a bit of patience will be back up to speed. Stevo has been a real trooper as he always is helping pick up the slack during a very busy summer while Dan recovers. I finally found time to post a good number of images of the Conn factory from my collection. I thought they were very interesting, I hope you do too. Spring has sprung!. I've posted a cornet and will try to get a few more horns listed as time permits. Our benchs are loaded with stuff to repair (nothing new about that), no time to give links, so you will have to make your own way to the pages of your choice..... not really, here you go. There is an Eb cornet and a few trumpets added in addition to a real nice Yamaha euphonium. Check them out. 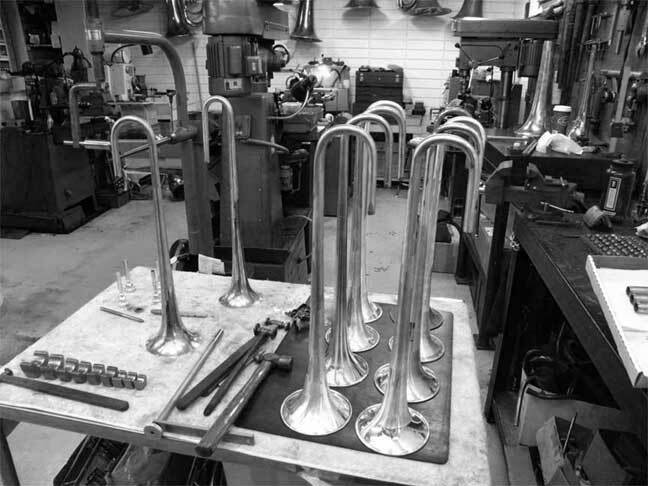 There are a few trumpets and trombones we have added to the sales pages. 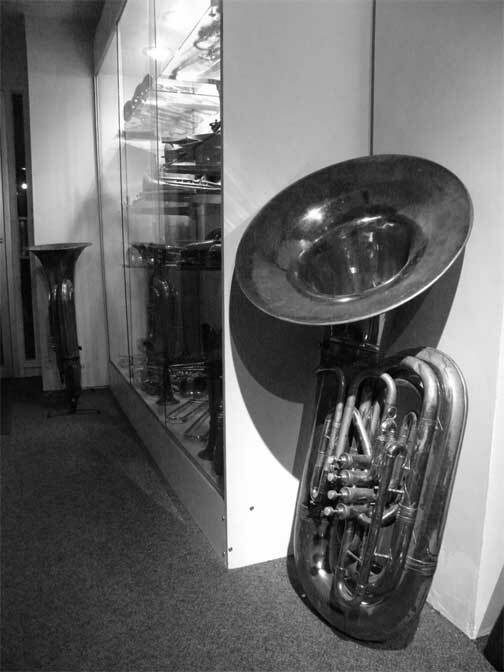 And, a King Euphonium just came available as well! You might want to check into it. Double bell projects, completd projects page. Also added, Reynolds "ONYX" trombone with F attachment $400! And, a really nice Yamaha 642 Euphonium just came available as well! Check it out! Another two quality trumpets added, have a look. Small addition to the completd projects page. Two more real nice trumpets added, nicely priced! A whole bunch of cool trumpets! We have added a couple of classic Selmer clarinets and a 1960 Buffet R-13 to our inventory, they are immediately available for purchase. Tuba mouthpieces, like new, great prices!